SENDA specializes in selling legumes, namely, peas and soya beans. Our company offers high quality cultures with available certificates of conformity. 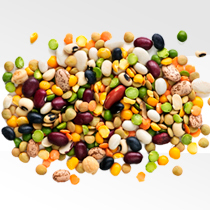 We have long experience in the agricultural market of Ukraine and our specialists are always ready to answer your questions about peas and soya beans, as well as to select products of the required quality (protein content, moisture, etc.). We are ready to guarantee you a custom-tailored approach, flexible pricing policy and deliveries in the shortest terms.